After our Cycle Chic Guide to Personalising Your Bicycle, we're keeping our eyes peeled for exceptional personalised bikes. I rode past this bike the other day. THIS is personalising taken to a whole new level. An entire zoological gardens of squeaky, honky bicycle madness. I counted 14. Gotta wonder what else this person collects. Tats? That's beyond cool! I hope (s)he's not afraid to use them! If they were tuned the rider could play music! 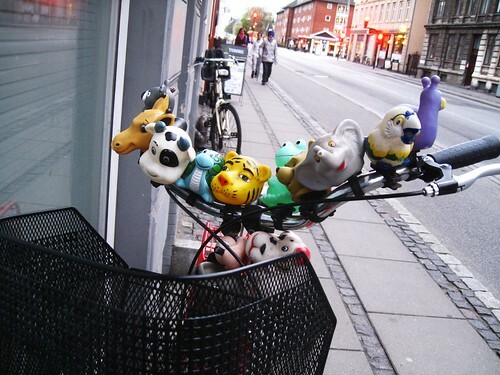 Squeaky animals are so cute.nice thing to accessorized.